Some time people get upset by the low performance of the computers ,computer start taking so much time in responding to your query ,suppose you want to open any folder the folder will open after 2 or 3 minutes.So there can be many factors that are behind to slow down your personal computers.Computers don’t maintain itself automatically ,actually you are the one who is responsible for slow down of your computers,you have to maintain your computers internally time to time like as you do when you buy a new vehicle and you take your vehicle to the mechanic for increasing its performance similar we have to do for our computers. So this guide will help you to increase your computer performance and save your computer from thrown out of window.In this ultimate guide to speed up personal computers we look at the every problems why personal computers become so slow and what should we do to tackle that problems.So let see each problems one by one. After buying the new computer we used many programs but never free up space using by those programs that become one of the reason for slow down of the computers like as we use internet explorer then the size of the cache and temporary internet files become so larger and then it start taking up space in RAM when we launched our programs so that why it is so necessary to clean up disk space.So there is inbuilt tool in every window operating system , we called this tool Disk Clean-up .You can easily find this tool in all windows operating system in by first going to control panel after that see below path. After Opening disk Cleaner choose which disk you want to clean up and then check the files that you want to clean up, see below pic. Now this will free your disk space and increase performance of your computer. Some time we install many programs according to our need but once your need is complete you must uninstall that programs.Why it is necessary to uninstall unwanted programs? 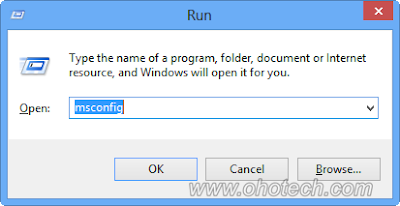 because it take space in Disk drives and also registry of programs are added to your computer registry so it is necessary that we remove such programs.You can uninstall any program by going in to the control panel and then go to uninstall a program . now go to start up tab and disables the unwanted programs that you do want to run on window start up. All the above steps are valid for all the window users except the for the window 8 users , so for window 8 users you have to go the task manager to manage the start up of your programs. There is one free powerful tool that do the same all the above three steps from a single place, this tool is powerful than the inbuilt tool of the windows ,this tool called ccleaner . you can download the ccleaner from the below link. See below pic how ccleaner look like it contain three main options to clean registry ,unwanted files and to disable the unwanted start up programs. So using this tool will help you easily manage your computer by clearing all the unwanted files and fixing all the registry so on the result you will see the increase in the performance of your computer. The programs data are fragmented all over the system so when we want to execute that program it take time for computer to access all the data of the program and that’s why it decrease the performance of the computer that why we need to defragment/optimize our drives , there is one inbuilt tool in windows OS that do this work for you.You can access to this tool by going to control panel after that see below path. After opening it choose which drive you want to optimize and then click on optimize button , see below pic. The whole process will defrag or optimize your disk and increase your personal computer performance. The next big problem that causes computers to work slow is viruses and spyware that infect our computers.I will highly recommend you to buy a good antivirus program i myself use ESET but you can also look at other antivirus products like AVG and Kaspersky it worth to have a good antivirus program ,if you don’t have so much money you cna also try the free virus software.But the question arise how a virus infect our computers performance ? Download Microsoft Security Essentials for free to help guard your system from viruses, spyware, adware, and other malicious software (also known as malware). The Microsoft Windows Malicious Software Removal Tool, also free, checks computers running Windows 8, Windows 7, Windows Vista, Windows XP, Windows 2000, Windows Server 2012, Windows Server 2008, and Windows Server 2003 for infections by specific, prevalent malicious software, including Folstart, Phorpiex, Weelsof, Blaster, Sasser, and Mydoom. It helps remove any detected infection or malware. Now you can see the options to change the setting for visual effects see below pic. 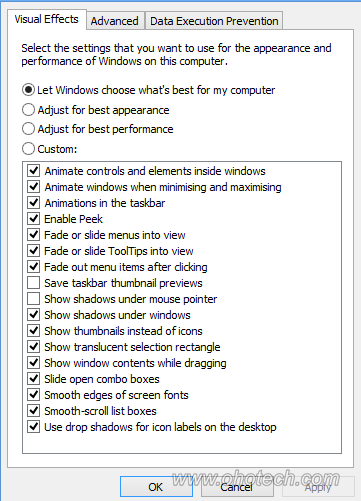 just play with these setting’s by choosing the custom option or you can also choose best performance for your computer. when you run any programs then the program are load into the RAM called random access memory ,so now if you have small RAM of 500 MB in size then your computer will deliver the poor performance so it is necessary to increase your RAM.But if you can’t do that then window provide a very great feature called ready boost .A new concept in adding memory to a system, it allows you to use non-volatile flash memory—like a USB flash drive or a memory card—to improve performance without having to add additional memory. 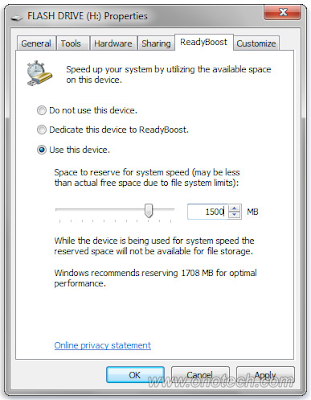 So how to use ready boost feature to do that you have to plugin your pen drive and then right click on the USB(pendrive) and choose the ready boost tab and then again choose the use this device and click on OKand Apply . That the end of the guide i hope you like my this post you can also look at my other post like how to check computer and laptop temperature and if you have any query leave comment and don’t forget to subscribe to my blog and follow me on facebook and twitter. removing viruses and unwanted applications will be a great help. nice post!